Firefighters wait for magnesium to burn out at a fire in Meridian Magnesium Products of America in Eaton Rapids, Michigan, May 2. The automotive parts factory where a May 2 explosion resulted in the temporary halt in production of the Ford F-150 pickup has a recent history of safety violations, according to public records. Violations included separate incidents in which employees suffered burns at Meridian Magnesium Products of America in Eaton Rapids, Mich., according to Michigan safety documents. Of the safety citations at the plant over the last decade, all occurred after the plant was acquired in December 2013 by Chinese automotive firm Wanfeng Auto Holding Group, according to a report in USA Today. 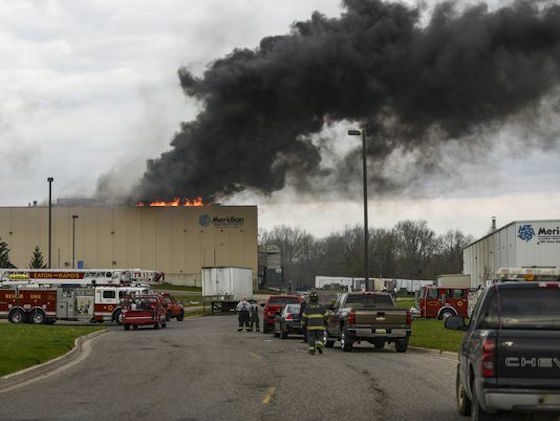 The non-unionized plant’s safety record is coming under scrutiny after two people were injured and over 100 employees evacuated when a fire and multiple explosions hit the small mid-Michigan community May 2. The plant has been cited for seven safety violations — three of them serious — since early 2014, according to public records. Inspections conducted at the company in 2011 and 2012 resulted in no citations, according to Michigan safety records. Those inspections took place before Wanfeng bought the plant. In recent years, the plant has been found in violation of Michigan Occupational Safety & Health Administration standards relating to worker safety around electrical equipment, die-casting machines and industrial trucks. The company was fined $6,700 for those violations, records show. •	An employee “was burned on multiple body parts” on Nov. 1, 2016, because the company did not provide “metal shielding to protect employees from inadvertent metal splash during die casting,” according to Michigan OSHA records. The company was fined. •	The company received a serious citation for lacking wheel chocks on powered industrial trucks during an inspection Jan. 13, 2014. The May 2 explosion closed the plant and it stopped the flow of parts to Ford, which, in turn, had to indefinitely suspend all production of the F-150. The pickup is the jewel of the F-series lineup, which qualifies as the best-selling vehicle in the U.S. and is a Ford profit king. The pickup is assembled at two Ford plants. At the same time, production at the Meridian parts plant could be offline for weeks. The plant makes support parts for the pickup’s radiators. Benjamin Wu, chief legal officer and public affairs director for Magnesium Products of America, said the company has one of the better safety records in the die-casting industry. Meridian also operates a factory in Ontario, Canada. Eaton Rapids Meridian plant manager George Asher said the company followed protocols during the May 2 incident. Eaton Rapids Fire Chief Roger McNutt said Meridian intends to rebuild and reopen its entire complex in four months. The plant’s roof was destroyed when the north end of the main structure caught fire.